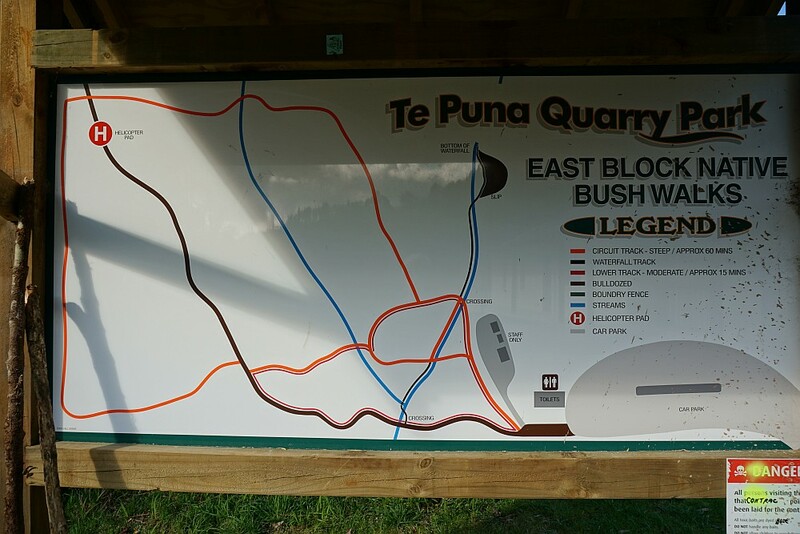 It was only at the end of the walk described in Part 1 that I realized there was another part to the Te Puna Quarry Park, consisting of bush walks through regenerating native bush, and a side track to a small waterfall. 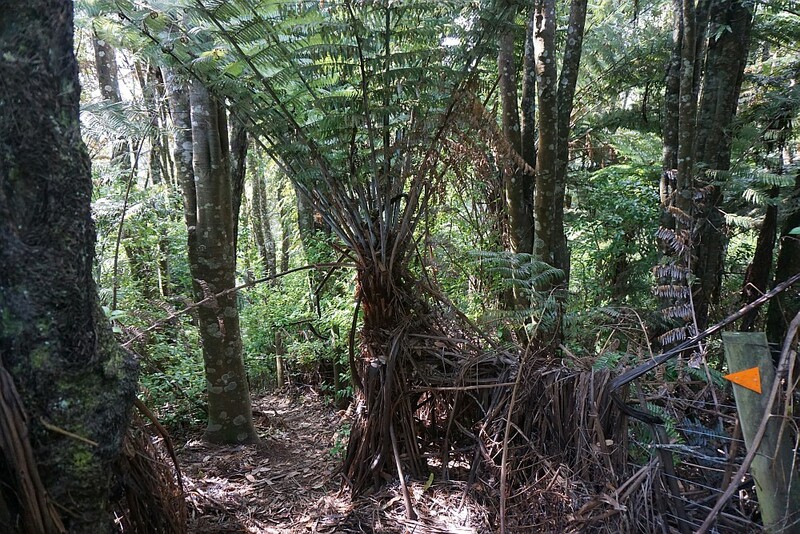 The East Block walks are not as photogenic as the ones described in Part 1, and there are very few locations with views over the western Bay of Plenty region. Some of the tracks are very steep, and can be slippery when wet and covered with fallen leaves. It’s not possible to walk through all the tracks without covering some of them twice, but in an attempt to walk all of them the distance covered was about 3.2 km, taking a total of 1 hour 45 minutes. Minimum elevation about 80 m above sea level, with highest elevation about 195 m asl. 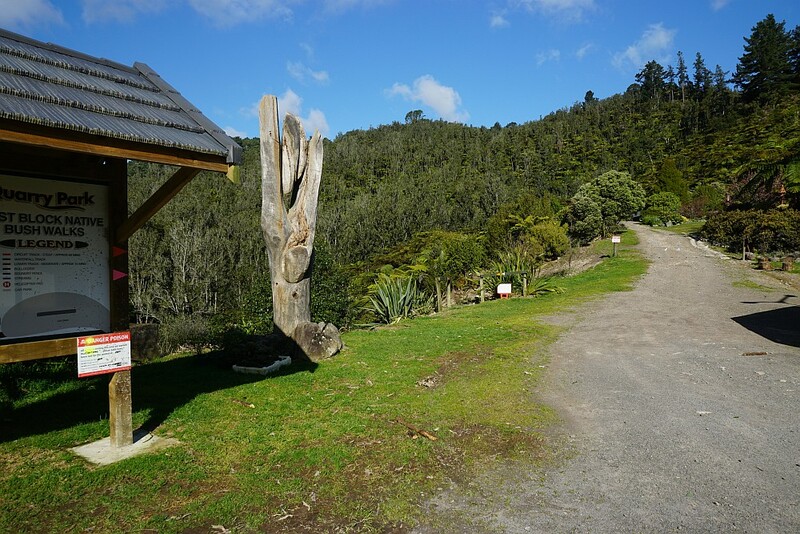 Birdsong, especially from the tui, could be clearly heard during most of the walk. 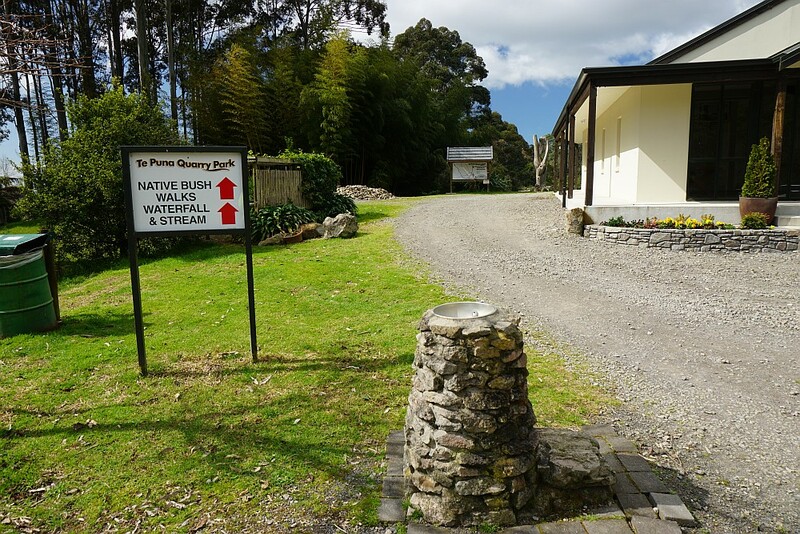 The sign at the far end of the carpark indicates that there are native bush walks ahead. The information board near the toilets shows all the tracks and the streams running through the park. The map has north at the bottom and south at the top, so is upside down compared to the GPS track log. 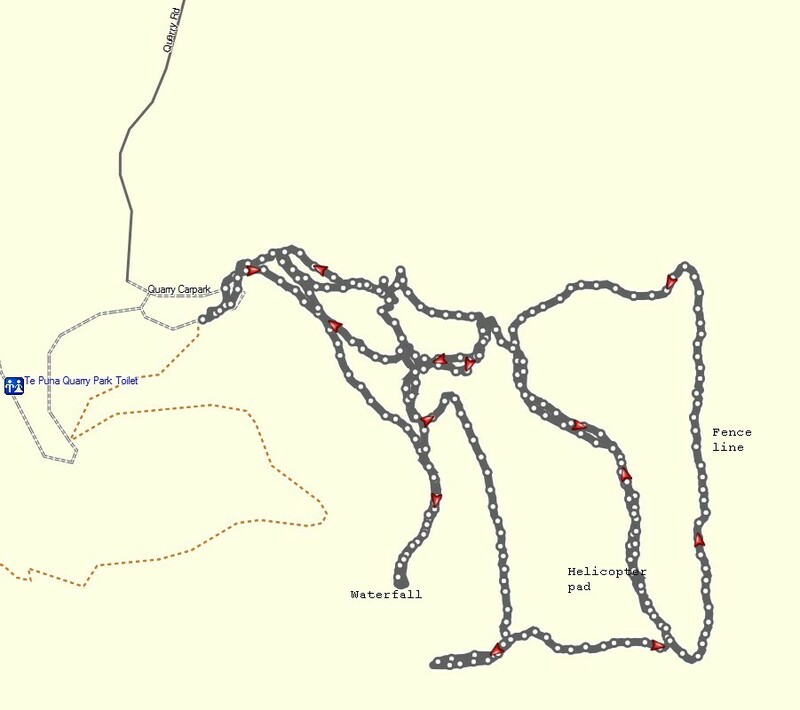 The GPS tracklog shows all the tracks walked. Several, such as the bulldozed track, were walked twice, but due to satellite reception they may appear as two distinct tracks. The tracks start to the right of the map sign, except for the bulldozed track which starts to the left. The start of the bulldozed track. 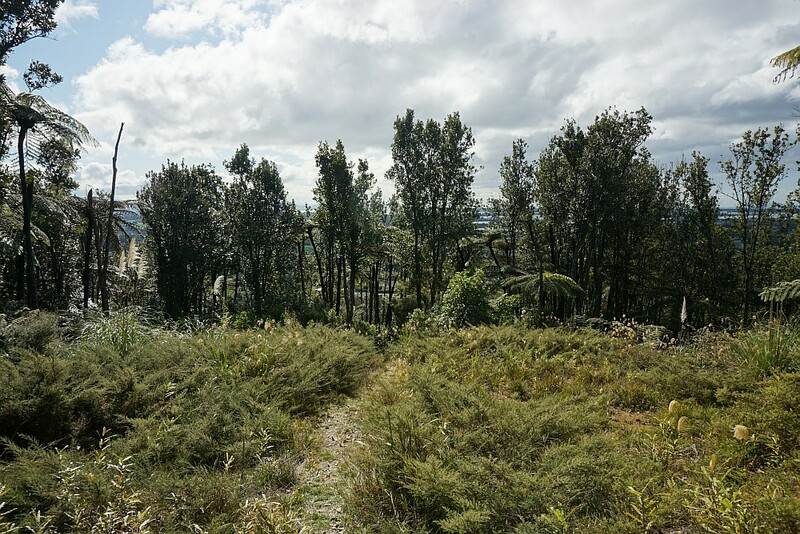 The kauri grove is unmarked, but there were young kauri trees growing a short distance below (north) of the helicopter pad. 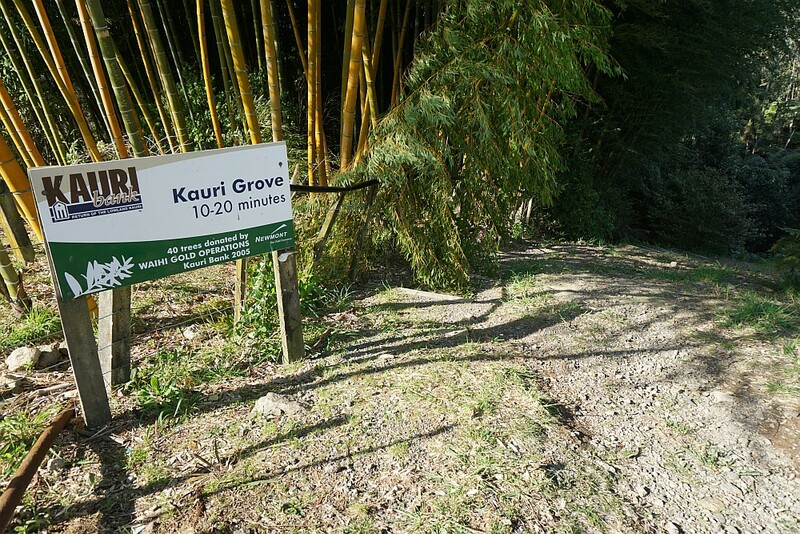 Presumably this is the grove indication on the sign at the start of the track. The stream crossings either have bridges over them, or they are easily crossed without getting wet feet. 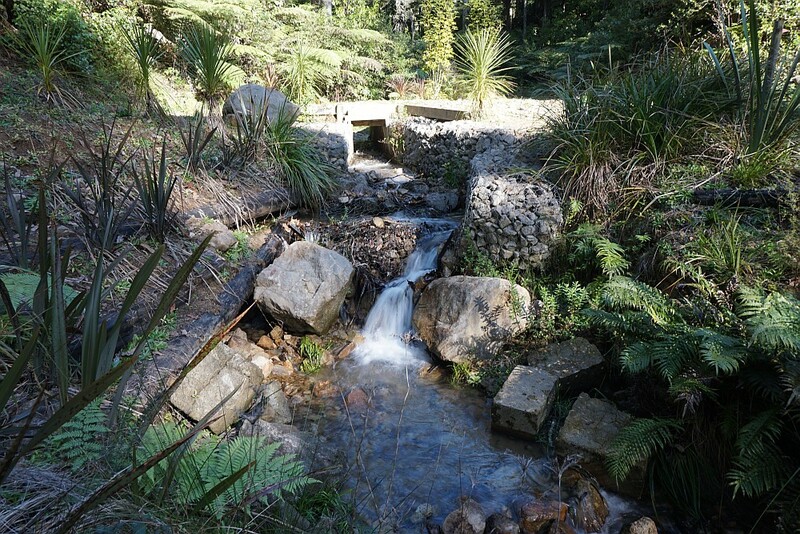 The side track to the base of the waterfall starts just to the left of the stream crossing. 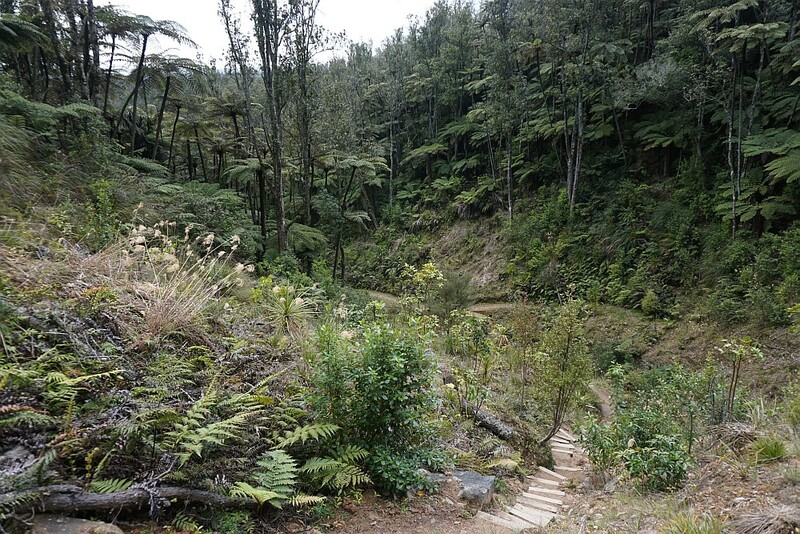 The track to the waterfall is quite steep, but does have steps across and up the face of a slip. There are very few steps on the steeper parts of the other tracks, except for ones cut directly into the soil. 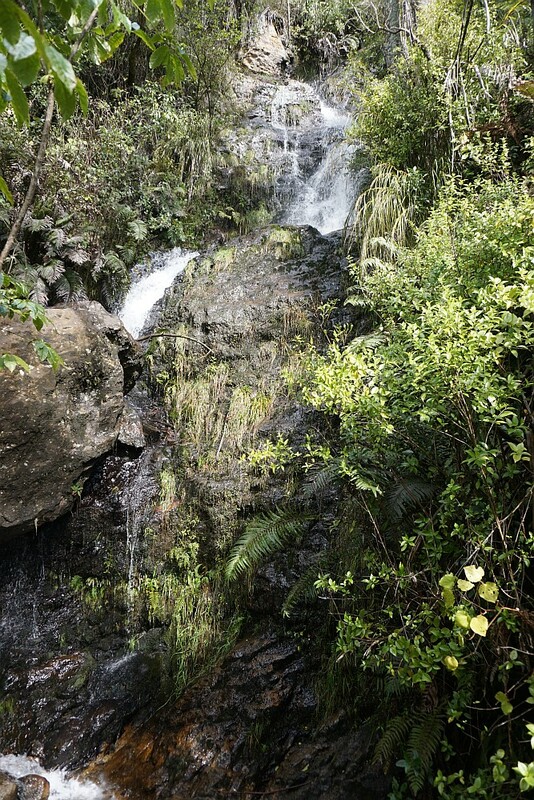 The small waterfall at the end of the track. 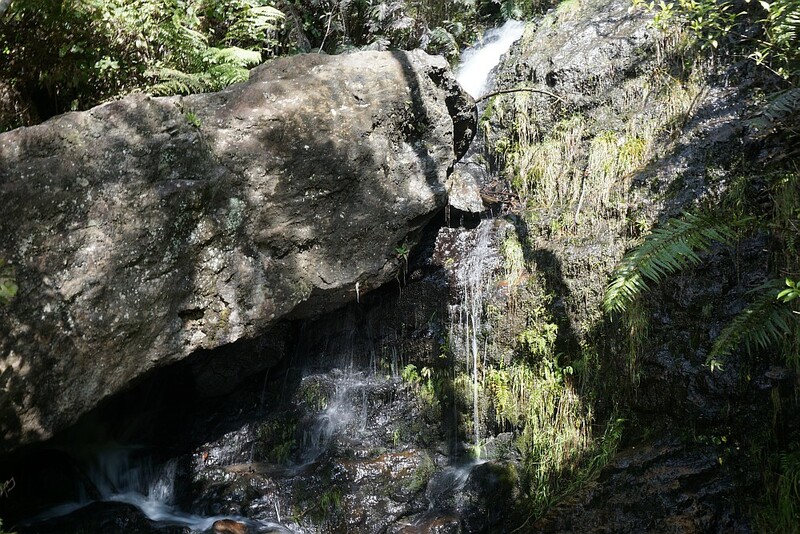 The water disappears behind a large boulder, and then reappears below it. There are no lookouts on the tracks, but one track leading to pest traps at the top of the hill had some views through the vegetation. 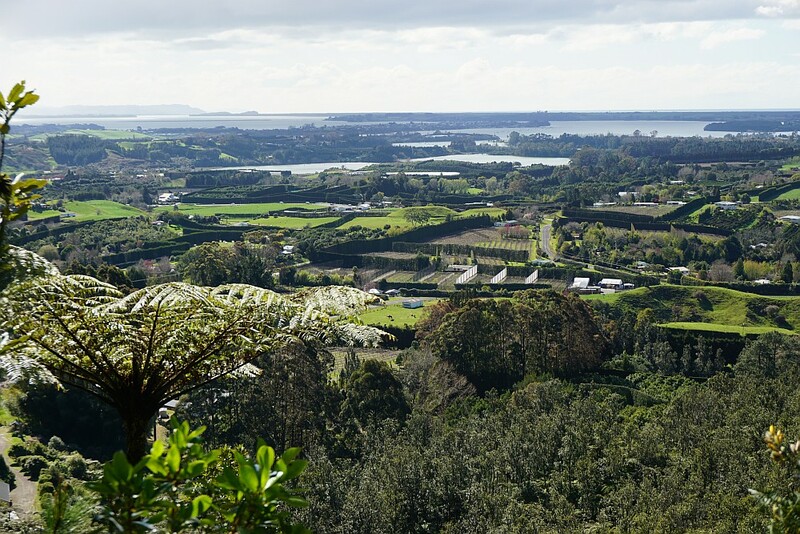 Here looking north-west towards the Coromandel Peninsula in the distance on the far left. The track is shown at the bottom left of the GPS tracklog. The helicopter pad showed no signs of having been used for some time. 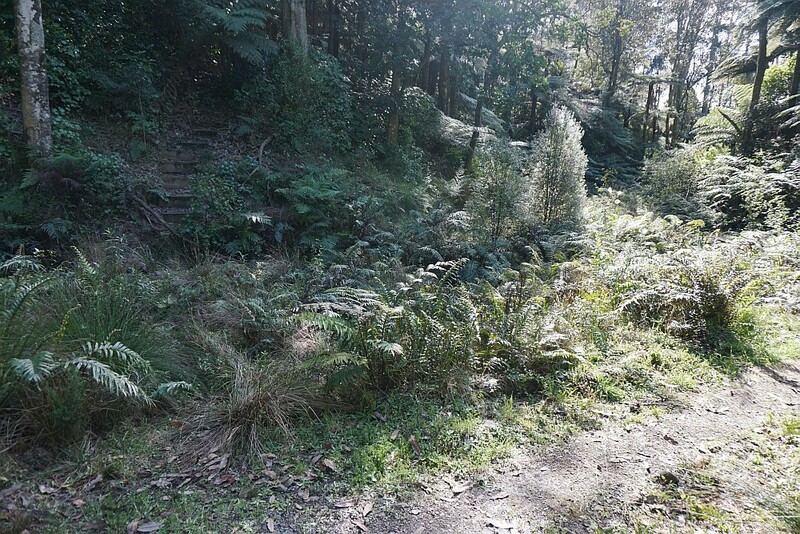 The easternmost part of the track follows the boundary fence at quite a steep gradient. The various tracks are marked with triangles of different colours. The track across the stream to the steps on the other side originally crossed here. Now there is a short detour to the right before returning alongside the stream on the other side. 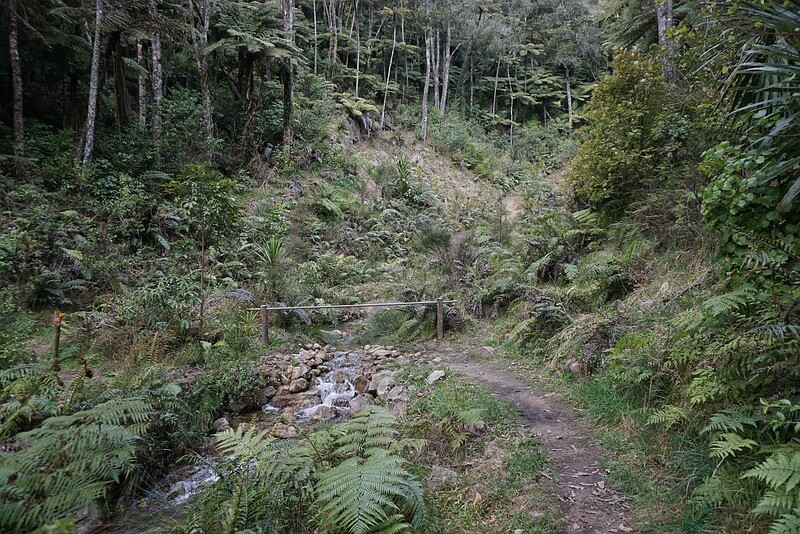 The bridge on the track just below where the two main streams join. The tracks were walked on September 6, 2015.